Director/Screenplay/Producer/Art Direction – Kaneto Shindo, Photography (b&w) – Kiyomi Kuroda, Music – Kikari Hayashi. Production Company – Kindai Eiga Kyokai/Tokyo Eiga. A mother and her daughter-in-law live together in a hut in a sea of reeds. Japan is rent by civil wars and their menfolk have been conscripted to fight. They make a meagre living by killing soldiers that come by and selling their armour. They are visited by Hachi, a neighbour who was forced to go off to war but managed to escape by pretending to be dead on the battlefield. He pesters the daughter-in-law and she eventually becomes his lover, sneaking away to his hut in the middle of the night. The mother does not want the daughter-in-law to leave because she is not strong enough to survive on her own and tries to stop her but the daughter-in-law ignores her. They are then visited by a samurai general who wears a demon mask to protect what he claims is a beautiful face from being damaged on the battlefield. The mother kills the general and takes the mask, placing it on and pretending to be a demon in order to scare the daughter-in-law into coming back. However, this has an unforeseen side effect. Akira Kurosawa revolutionized Japanese cinema in the 1950s beginning with Rashomon (1950) and continuing with classics like The Seven Samurai (1954), Throne of Blood (1957) and Yojimbo (1961). 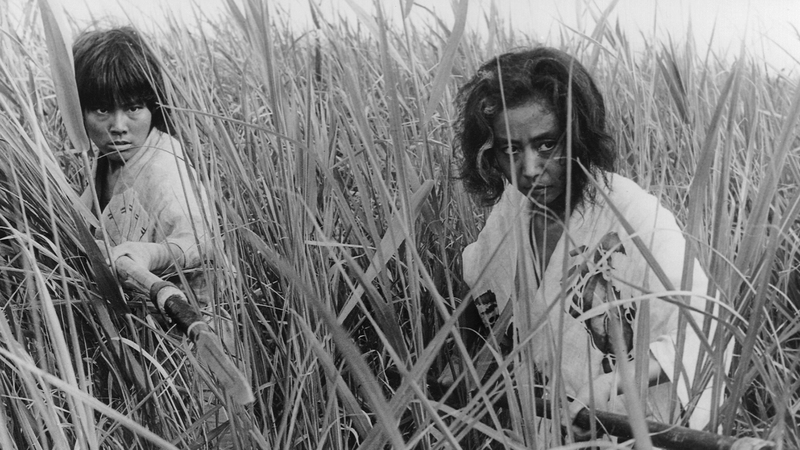 Kurosawa’s stark yet lyrical realism achieved the same type of artistic redefinition of Japanese cinema that the neo-realists did for Italian cinema a few years earlier. 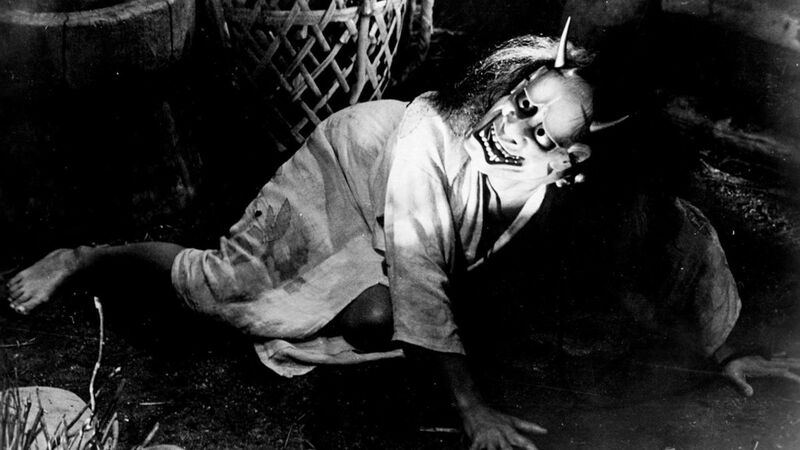 Oni Baba (usually erroneously written as one word) brings Kurosawa-esque neo-realism to bear on the traditional Japanese kaidan (ghost story), also a genre that took off on film in the mid-1950s. The story arc here is familiar to kaidan eiga and to Westerners through the anthology story patented by the likes of The Twilight Zone (1959-63). In fact, Oni Baba is a very Twilight Zone-esque tale, dependent as it is on a harsh and moralistic twist ending wherein the supernatural intervenes to punish an individual for their greed. Director Kaneto Shindo employs Kurosawa’s black-and-white starkness to striking effect. The emphasis is on the poverty and bareness of the people’s lives. The film takes place with the most minimal of locations – moving back and forward between the two women’s hut, Hachi’s hut and the river, with occasional sojourns to the home of the weapons dealer Ushi. There is the ever-present sea of reeds, which are almost like an unspeaking character in the film – their bareness and barrenness seems to act as a giant cyclorama that amplifies the tortured emotions that take place before them. Kaneto Shindo does an equally good job on the writing. There are some fine stretches of dialogue that survive even through the subtitled translation – particularly the scene where the mother confronts Hachi, even offers herself to him, in order to keep the daughter from leaving because, we come to realise, she will be helpless left on her own. There are some wonderfully subtle moments where the mother plays a game with the daughter-in-law digging at what she knows is going on – Hachi outside howls to call to her, they ‘presume’ it is a dog. “It’s looking for a mate,” the mother jibes. The scenes with the appearance of the demon, all underlit and floating through the air, are genuinely eerie. This is somewhat undermined by the revelation of a mundane reality, where, during the appearances, Shindo seems to be trying to conjure something that is clearly supernatural in effect. The film features a surprisingly high degree of toplessness from the two actresses – well before such ever became permissible in mainstream Western cinema. Kaneto Shindo was a director whose career has spanned an incredible seven decades – he is still directing in 2010 at the age of 99. However, Oni Baba is the only film of his that is widely known in the West. His one other film of genre interest is the equally powerful Kuroneko/The Black Cat (1968), which returns to the same milieu of a mother and daughter whose menfolk are absent at war and concerns the two women returning as ghosts to kill samurai after being raped and killed.